For those of us who are more inclined to coffins and spiderwebs than candy and stuffed bears, here's a list of ten items you can buy now that will make your black heart swell with delight. Known for detailed hand drawing and custom high quality printing, Poison Apple Printshop has released a few lovely Valentine's designs that are definitely edgy to say the least. Get yours here. Year after year Vegan Treats bakery makes us all swoon with their artisan chocolate boxes. As their name says all items are vegan as well as carefully handmade and utterly delightful. They may come with a high price tag but this is a gift your special someone will never forget. Order from Vegan Treats' website. Whether smooching is on the agenda this Valentine's Day or not, you should treat your lips to the spookiest lipsticks around. Made in small batches in Puerto Rico, Necromancy's gorgeous lipsticks are lovely from their high pigmented rich colors to their matte black sleek cases. Check out all of their colors here. 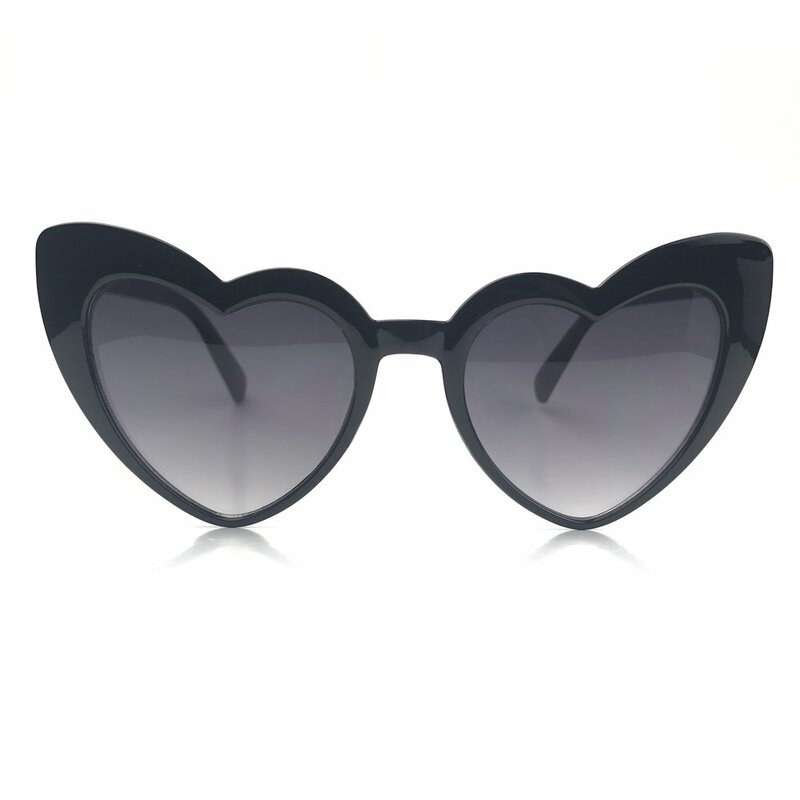 It'll be "heart eyes" all day with these new sunglasses from Foxblood. Unlike your typical heart sunglasses, these feature a cateye shape making them even more fun and fashionable. Pick yours up from Foxblood's site. Known for their custom planchettes, Fiendies makes communicating your hearts desires easy this Valentine's Day - Oh and inside of that pretty black box is the most beautiful collection of chocolates you've ever seen! Visit Fiendies website for more of their Valentine's items. Cara Mia! Mon Cher! 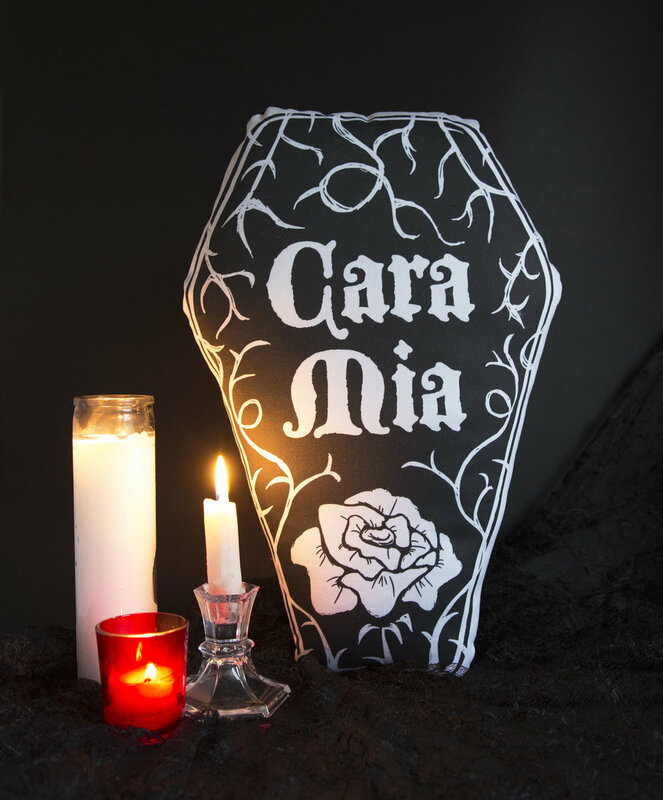 Inspired by the Addams (couple goals) this handmade coffin pillow by yours truly would make any Valentine's eve cozier in your haunted home. Get yours here. 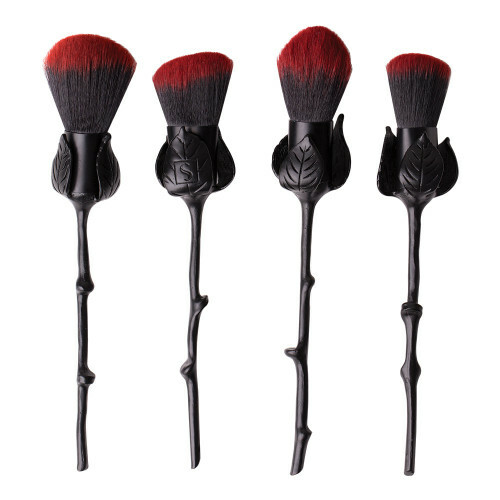 A bouquet of roses is nice, but a bouquet of black rose makeup brushes from Storybook Cosmetics is even better. And these roses will never wilt! Get yours from Storybook Cosmetics' website. Even if For Strange Women's scents were only half as intoxicating as their lush product photography they'd still be out of this world incredible. Their wearable perfume jewelry contains carefully hand mixed fragrances focused on releasing beautiful natural scents with the magic of plants and florals. Buy yours here. 9. Darkwave Candle Collection - Burke and Hare Co.
With packaging as dark and mysterious as their scents, Burke and Hare's candles add the perfect ambience to your romantic evenings. Stock up on their website. I couldn't make this list of items without mentioning one of my favorite companies ever. Witch Baby Soap's Valentine's collection ranges from spooky to sweet and delivers lovely scents all around. Grab yours here and relax later.